My wings are light green with yellow stripes that have a long wing tail. My wingspan is approximately 5 inches long and 4 inches wide. I am one of the largest moths in North America. As a caterpillar, I will eat hickory, sycamore and walnut leaves. I do not have a mouth and do not eat as an adult. I am found in trees of the eastern part of the United States and into Canada. I only fly at night and that is how I got my name, the word 'luna' means moon. I will go through four stages of development: egg, caterpillar, pupa (cocoon), and adult. 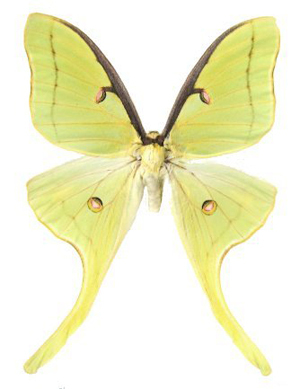 The female can lay 400 to 600 eggs, four to six eggs at a time on the underside of leaves. It can take up to two weeks for my egg to hatch into a lime green caterpillar with small orange spots along the sides. It takes about six weeks from the time my egg is laid for me to turn into an adult. As an adult, I only live about one week.